You could blame Switzerland for my E4 adventure. The first time I did place to place unassisted walking was about 10 years ago, with Christine, when we went from Grindelwald to Gstaad and my enthusiasm for this style of walking has grown ever since. Of course we were completely spoilt by the scenery, particularly the awesome views of the Eiger and the Jungfrau, but it was the excitement of a new walk everyday and the sense of achievement from looking back over ground covered that really got me hooked. Switzerland really is a different country. Intensely associated with the Alps (almost interchangeable) it has lots things going for it. Famous for its long history of independence and neutrality it somehow combines an intensely decentralised form of government (all the way down to referendum) with really strong national institutions (a conscript army based on national service). Famous of course for its financial services (infamous to some (particularly Harold Wilson)) it actually has a broadly based economy with the highest per capita level of manufacturing in Europe (interesting counter factual - it also has the lowest proportion of graduates in its workforce). Switzerland is a successful country and all this makes for easy hassle free visiting. 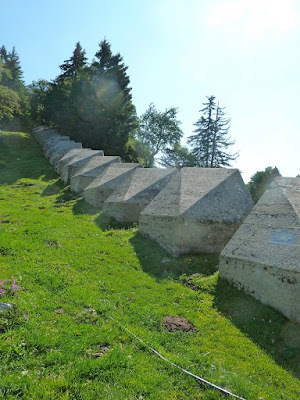 As it happens the E4 route through Switzerland does not take you through classic Alpine scenery (that comes in buckets in Austria) but through the less well known Jura Mountains and then along the southern shore of Lake Constance. Through the Jura the route follows the Jura Crest Way (known locally as the Chemin des Cretes or the Jura Höhenweg in German). The Crest Way is one of the oldest national trails in the world with original development starting in 1905. 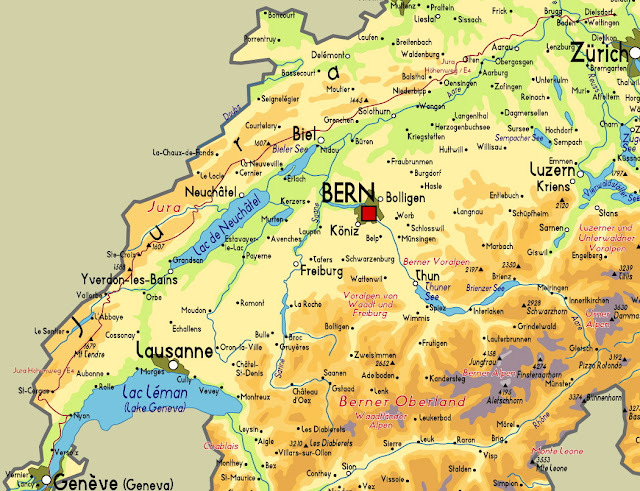 It starts at Nyon, just north of Geneva, and finishes at Dielsdorf, just north of Zurich, joining up Switzerland's two largest cities. As the name suggests the route follows an east west ridge overlooking the central plateau with its huge lakes and with the Alps forming the horizon to the south. After the Crest Way there is a messy couple of days as you cross over to the Rhine and Lake Constance and than an easy walk along the southern edge of Lake Constance (Bodensee in German) to Rhieneck before heading into the Alps again and the Maximiliansweg. When I was planning the route I had two really good sources of information. The Swiss Hiking Federation website, which provides both an itinerary and a description of the stages, and a site called Activity Workshop, which provides a KMZ file for the route (which you can display in Google Earth) and loads into the GPS on my Iphone. As it happens Switzerland's footpath waymarking turned out to be amazing and, as far as I'm concerned, sets the international standard. You feel like your walking on a real network comparable to the rail and road networks with signs designed to enable you to choose walking as an alternative way of getting from place to place (the cycle network looks just as impressive). It's also completely integrated with the public transport network so if you do lose the signs (there is always one in line of sight) all you have to do is find the train station (everywhere) and you find the footpath signs. The biggest test for waymarking for me is going through towns. It's in towns where choice increases and where you're more likely to make mistakes and lose your way. Swiss waymarking in most cases was good enough to take you right through even large towns and I went through Switzerland without maps and without the using of my GPS. Walking in Switzerland does have it down sides. It was the most expensive country and accommodation wasn't generally as good as elsewhere. I also have a downer on central European food. For me the food started to get worse in Switzerland, declined further in Germany and Austria and didn't get better until I got to Hungary. Like all general rules there are lots of exceptions and the first night's accommodation in Saint Cergue and the food and accommodation at the Hotel de la Poste was good and not too expensive. The first day's walk was good as well, easy walk through meadows to the Col du Marchairez. Another general rule, certainly for the E4 in Switzerland compared to the E4 in France, is that the meadow to tree ratio was much better - a lot more open and better views. I also had good weather on the first day, a bit less humidity would have produced even better views of the Alps, and it would have been perfect. The hotel/refuge at the Col du Marchairez was also nice and they made me a huge sandwich for lunch and wouldn't accept any payment! The weather however had turned nasty and during the day went from dense fog to rain. Great shame as the walk to Baillaigues took me up a gentle climb over Mount Tendre, the highest point on Swiss part of the E4. The views would have been great but even in the rain it was a good walk down from Mount Tendre, across an upland plain and then down towards La Pont and then on through a valley and down further to the town of Vallorbe. I stayed at the Hotel La Croix d'Or which did comply with the general poor accommodation rule. The weather improved the next day and the walk to Sainte Croix was excellent. I had views of both Lake Geneva and Lake Neuchatel but still too misty for the Alps beyond. What I worked out at this point was that the stages on the Swiss walking web site are all designed to get you to public transport points and not necessarily the best places to stay. Sainte Croix has accommodation but it was expensive and I ended up in a bed and breakfast out of town. I would have been better off walking another 5 kilometres and staying at the refuge at Le Chasseron which is perhaps the most scenic place to stay on the whole Swiss section of the route. The walk the next day was wonderful. I decided not to worry about the humidity spoiling the views of the Alps as the shorter views, the lovely hay meadows in particular, were just excellent. The ridge walk either side of the amazingly positioned Hotel Le Chasseron was particularly good but the real highlight was the Le Creux de Van, a huge Malham Cove type limestone semi circle, which provides the iconic view of the Crestway. I stayed at the right place as well, a refuge at Le Solait, near the Le Creux de Van, where I had my annual fondue. Not quite so good the next day, occasional views of Lake Nuechatel and to the Le Creux de Van, but a lot tree walking. It started with a huge walk down to the town of Noiraigue and then a big climb up the cliff on the other side and then along the ridge to Vue des Alps with the scenery gradually opening up as you went. The hotel at the Vue des Alps was a bit disappointing, on a busy road with poor food. The walk next day was brilliant, lots of fabulous open countryside and amazing views of the Alps. It was all good but I guess the high-light was the walk up the Chasserol. There is a hotel (very expensive) and a huge telecoms tower at the top, a very popular spot. I stayed in the Auberge des Gorges at Frinvillier, good food and a really helpful host. The good walking continued to Hinter-Weissenstein, perhaps the toughest day on the trip (not very tough) and certainly the only stretch where you needed just a slight head for heights. It was also along this stretch that the language spoken went from French to German with the Chemin des Cretes (the Crest Way) turning into the Howenweg. The ridge also gets narrower and at one point becomes just a sliver of limestone. Stayed at farm Gasthof set high up on the side of a valley, a perfect location. Gradually the ridge is starting to shrink with residual lumps of limestone stick out of the landscape like old teeth. Between these lumps there are huge meadows usually with hay already captured but lovely and green for all that. The intensive use of the Swiss countryside for agriculture does give it a beautiful but perhaps, for some people, a slightly manicured look. I like it. Balsthal is quite a big place and the Hotel Balsthal a big but not particularly nice hotel. Stiff climb out Balsthal, up to 1,000 metres again, and then more of the same wonderful ridge walking which by now I was taking totally for granted. Along this stretch your again reminded of the proximity of the German border with defenses enforcing Switzerland's distinctive armed neutrality and how the Crestway has been enhanced to form a defensive barrier. Just before Hauenstein, at Belchenflue the whole mountain has been fortified, anticipating an invasion from the north, with construction dating back to the First World War. Stayed in a bed and breakfast at Hauenstein and ate in the local restaurant. If I was just walking along the Crest Way than I would go east to west. This penultimate stretch to Brugg is nice but somehow doesn't add anything to what you have seen already. You're are getting lower and the landscape is becoming more arable and less attractive, coming the other way though it would be a good introduction to what comes next rather than an anti-climax. Brugg is a fairly big with a historic centre sitting on a bend in the River Aare. Like all Swiss towns of any size there is an obvious manufacturing sector. Stayed in a hideously expensive hotel although there was a good choice of places which were similarly priced. Had my only bad Swiss navigation day next missing the route out of Brugg (going by the river rather than climbing to the top of the ridge), and then missing it again out of Baden. Eventually found it after some bushwacking to the east of Baden and then followed it down a lovely path to the very pretty town of Regensburg. I didn't know precisely which route I should be taking to Stein am Rhein, where I would pick up the route as it went along the south bank of the Rhine and Lake Constance, was was relying on a list of towns as stepping stones and using the foot path signs to take me from town to town. Bulach was the first stepping stone, it's just north of Zurich airport. Stayed in a very poor hotel. As I understand it the official route goes Bülach, Freienstein, Irchel, Ober-Buch, Dorf, Großandelfingen, Truttikon and Oberstammheim to Stein am Rhein. I ended up going via Neftenbach and Adelfingen. I'm not sure which is longer or better but I started at 7 and got to Stein am Rhein at 5.30, a 44 kilometre walk. Stein am Rhein is an absolutely gorgeous town, stunning timber framed painted with medieval scenes. I stayed in a sort of refuge on south side of the bridge over the river and had a very sub-standard curry. It took me three days to get from Stein am Rhein to Rhieneck and the border with Austria. It was almost flat all the way and navigation very easy, just keep the water to the left. On the first day I made it to Ermatingen which meant walking along the south bank of the Rhine. An interesting walk during which you get to see the wealth of the Swiss, displayed in stunning houses with radical modern designs; the enterprise, all the little towns even in such scenic surroundings had factories; and, the organisation, the amazing public transport and intensively used cycle networks. Ermatingen is a typical little resort town and I stayed at the Hotel Adler which was very good and reasonable, although like most Swiss hotels in small towns you have to share a bathroom etc. Next day I continued along the bank of the Rhine and then through the suburbs of Konstance and learnt that Konstance is actually in Germany. Past Konstance and you're on the southern shore of the Lake (Bodansee) and the route takes you through one little resort village after another. I perhaps chose the wrong one by staying at Romanshorn. Could only find one hotel, opposite the station, and had perhaps my worst breakfast of the trip, a very run down sort of place. The last day in Switzerland was a bit messy (so was the first day in Austria) and it felt like the footpath didn't actually make it all the way to Rhieneck. Just like yesterday the walk then took you through a series of resorts, Arbon, Steinach and Rorschach. Just past Rorshach, which was the largest resort, maybe at Staad, there was a huge railways works where the very same trains that have been flying past me on the local line for the last few days are built. You then have to get past a little airport before finding the old River Rhine and walking down its west bank to Rhieneck. Most people around were doing place trips on bikes and given the amount of hard surface walking along the south bank of Lake Constance I can see why. A couple of places to stay in Rhieneck I stayed at the cocktail bar - although the bar was shut. Hi Could i ask some questions? How did you solve the problem of shower and toilet? Did you stay all days in refuge? I’m planning all days by camping but during TMB I had no problem of above two things but i heard this trail is difficult to find camping site. Are there any solution for this? Or some refuge, can we pay for bathroom and toilet only? And another important thing is water, i heard it is difficult to find but each daily can get water somewhere or could we ask for some randomly house?? Somebody said 4 liters will be good. Minimum should be 4 liters?? How about food?? I’ll bring some energy bar, how did you solve eating? Much Thanks. I will leave tommorrow so that only comment, please understand.